← Who is the Conference For Anyway? This post was first published on www.pedalgogy.net in May 2017. The 3rd annual Tashkent International Cyclothon will take place on 14th April 2018. We will also we challenging ourselves to ride as many kms as possible on that day with our fully loaded bikes here in Indonesia. We will add our sponsorship to the total raised by TIS. All funds raised will go to PWSA. 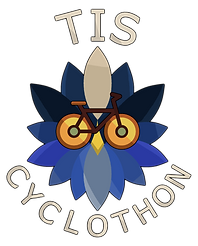 On Sunday April 2nd 2017, the Tashkent International School Campus became a bicycle track for the 2nd TIS Cyclothon. Students, staff and parents pedaled around the circuit to raise money for Prader-Willi Syndrome Association UK. The event was well attended with over 100 people from the TIS community taking part in some way. Collectively 2200 kilometers were covered between 8am and 6pm. That’s about the same distance as Tashkent to Dubai! Each rider was sponsored by their friends and families per kilometer that they covered. Some managed to raise enough support to receive $10 per kilometer, and went on to hit 50kms. In fact two students managed to reach 85kms each for the day!! It was wonderful to see determined young people pushing themselves physically, whilst they were also aware that with every lap they were having a positive impact on other children who have Prader-Willi Syndrome. At the same time, inside the school gym, the first school Service Expo took place with students promoting their service projects from the academic year. Students were also selling merchandise to raise funds for their causes, and organizing games for visitors to take part in. The weather was pretty bad for a bike ride, but one cannot be miserable on a bike so it was still a great day. Thank you to the TIS community for taking part and making this event such a success. The Prader-Willi Syndrome Association will be using the money for family support network events this summer as well as investing in research. For videos of our bicycle ride around the world, subscribe to our You Tube channel. This entry was posted in Matthew and Niamh. Bookmark the permalink.